This Recipe is for 10 Burgers. You Can take Ingredients according to your quantity of burger. This recipe is one of the easy recipe. The Indian Burger is really resembles with American Burger. This fast food item is heavy and fills the stomach for long hours. This is a good snacks item ideal for kids who are always hungry in the evening and loves to have “delicious” looking food. 1. Mix all the ingredients of tikki except paneer and oil. After mixing it well, make 10 balls out of it. 2. Heat oil in a nonstick pan. Now, take one ball at a time and stuff it with one tsp of paneer and shape it into a flat tikki. 3. Make all the tikkis and shallow fry in the pan from both the sides on slow flame. 4. Take one burger bun and cut it from the middle. Now toast it with little butter. 5. Put one tsp of ketchup on one side of the bun and one tsp of green chutney on the other. 6. Place a tikki on the bun, followed by a slice of tomato, cucumber and onion. At last, put some shredded cabbage and cover it with the other part of the bun. 7. Pierce a toothpick through the bun. Likewise, make all the burgers. 8. 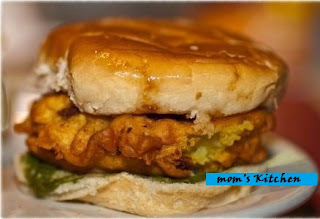 Aloo Tikki Burger is ready to eat. Serve hot with green chutney and ketchup. I love a good vegetarian burger, and this sounds delicious! Thank u! I wanted to start a burger business at school. The school canteen burgers taste like puke! When the holidays are over, im gonna make a lot of profit!